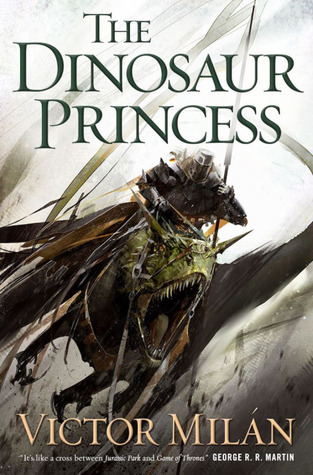 While I adored The Dinosaur Lords, I hit a slump with its sequel The Dinosaur Knights, with one of my disappointments being caused by the portrayal of female characters especially Princess Melodía who was my favorite character from the first book. But then I learned the next book’s title – a good sign that things could be turning around for Melodía? Despite my quibbles with the previous novel, I always did plan on continuing the series, and the description for the next volume is getting my blood pumping again. Plus, just take a look at that cover. And gawk. Ooh that looks interesting! Totally new to me! Hope you enjoy it once you get to read it! Glad to hear that the author seems to be introducing an important female character to the plot. Sadly, I could not get through The Dinosaur Lord despite its gorgeous packaging due to the lack of ladies and my issues with the pacing. I don’t know that I’ve ever read any books featuring dinosaurs. This series sounds interesting. Agreed, that cover is pretty awesome:-) I haven’t started this series but it sounds like I’d love it. I mean, how often do dinosaurs pop up in fantasy?? Well, at least, the cover is gorgeous! I definitely intend to read it, but like you, I do hope this one is a step up from book two.